In addition to receiving ADS-B signals, the ADS-B antenna also receives Cell/Mobile/Pager signals in the range 800 MHz to 1200 MHz. The Cell/Mobile signals are generally much stronger than the ADS-B signal. When these strong signals reach the receiver, they overload its front end tuner. This overload severely affects performance and reduces maximum range and number of planes. Stronger the Cell/Mobile signal, lower is the max range & number of planes. To overcome this situation, a hardware called “Filter” is used. As its name shows, it filters out unwanted signals and passes a narrow band of frequency around 1090 MHz (say 1075 MHz to 1150 MHz), blocking most Cell/Mobile/Pager signals from reaching the receiver. In order to determine if a filter is needed or not, it is necessary to scan frequencies in the range 800 MHz to 1200 MHz. If the scan shows very few and weak interfering signals, adding a filter will not give any appreciable improvement. On the other hand if the scan shows a lot of strong interfering frequencies, adding a filter will give substantial improvement in ADS-B 1090 MHz reception. Software developers have developed softwares which use a very low cost ($10) hardware (DVB-T) to perform this scan. There are following 3 ways it can be done. Please click the options below to see the details. Please note that you have to connect an antenna to DVB-T. It can be either the whip antenna supplied with the DVB-T, or preferably your regular ADS-B antenna to get more realistic results. Since DVB-T's antenna socket requires a MCX-male fitted to antenna cable, you will need a pigtail with MCX-male connector at one end, and at other end a connector which matches the connector on your antenna cable. DVB-T is plugged into a Windows Computer - Using GUI rtlpan,exe. DVB-T is plugged into a Windows Computer - Using Command Line. DVB-T plugged into Raspberry Pi. 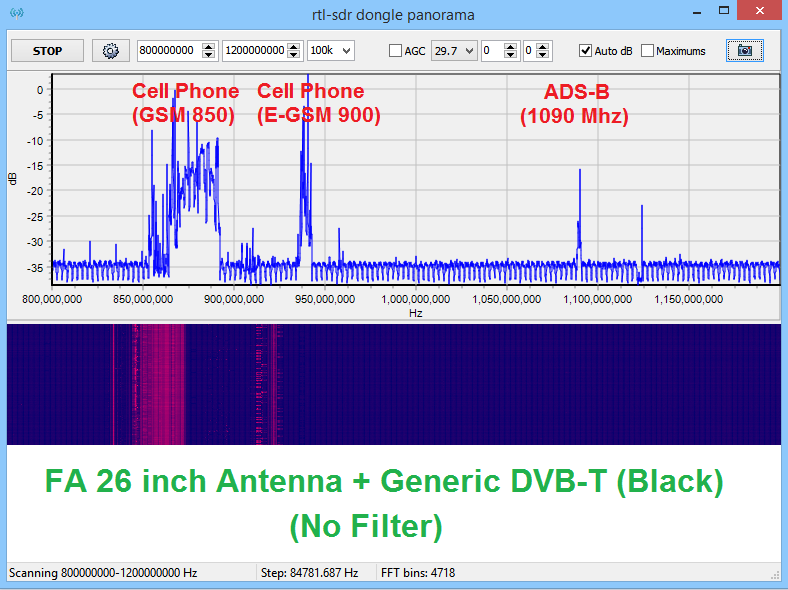 This method uses software tool rtl_power which is part of software package rtl-sdr. Free the DVB-T Dongle which is in use by a decoder like dump1090, or dump1090-mutability, or dump1090-fa. The above command will generate following output. Tuner gain set to 29.70 dB. Wait for 30 minutes for scan to finish. When scan is finished, it will say "Exiting.... Canceled by user". Scan will create a file "scan.csv" in current folder and save scan data in it. This will produce a very wide image (4000 pixels) that shows spectrum power from 800MHz - 1.2GHz. If you want a narrower image, increase “100k” above to something larger, it controls the bandwidth that corresponds to one pixel on the x axis. -e is the total runtime, longer gives you a taller image. Don't forget to Reboot Pi so that system is restored to normal, and data feeding is restored. Create an image "scan.png" in current folder from data stored in file "scan.csv"
This will produce a very wide image (4000 pixels!) 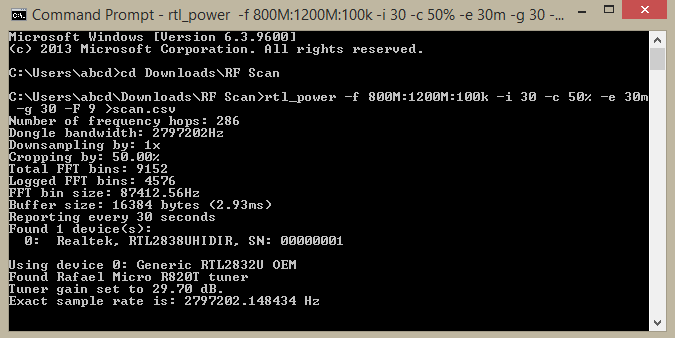 that shows spectrum power from 800MHz - 1.2GHz. Copy the image "scan.png" from Pi to your Win/Mac Computer. To copy a file from Pi, you will need to install on your Win/Mac computer an SCP software. Some popular free of cost software are FileZilla (win and mac) or WinSCP (win) or CyberDuck (win and mac). The original image is very wide (4000 pixel), but displayed in this forum smaller (1280 pixel). As a result details are not clear. Three 500 pixel wide cut-outs from above 4000 pixel wide image. These cutouts show details better. 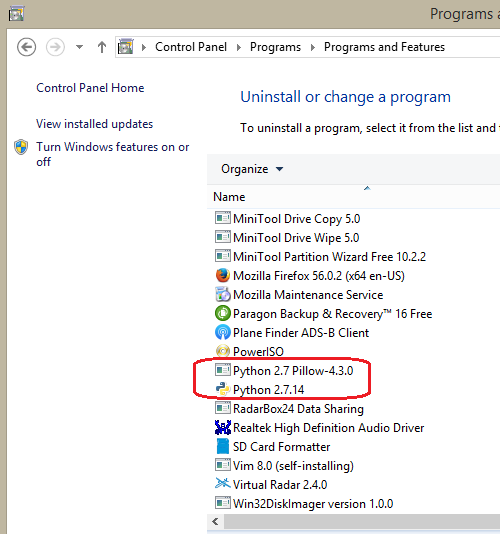 Important: If you want to plug in your DVB-T Dongle into Windows Computer, you should install its driver Zadig. Create a new folder of a name of your choice and at a location of your choice. 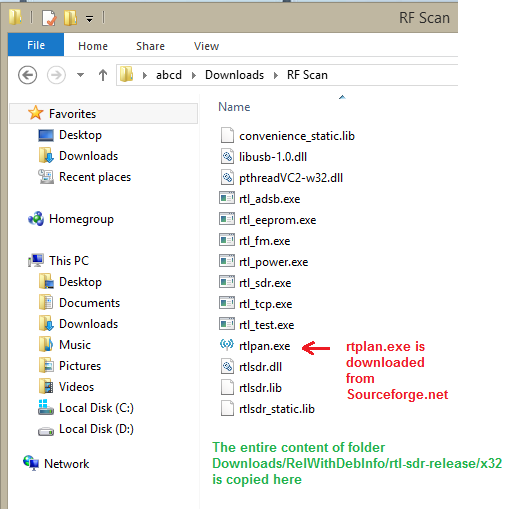 For this guide, I will use new folder name "RF Scan", location inside "Download" Folder. Un-zip RelWithDebInfo.zip. 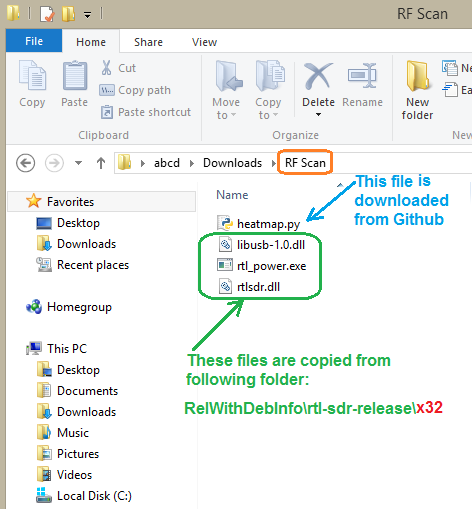 It will create a folder RelWithDebInfo and inside this folder another folder rtl-sdr-release which contains several files and 2 folders named x32 and x64 . 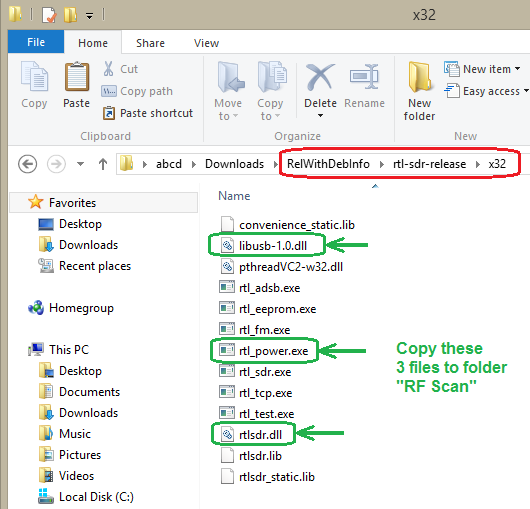 Copy ALL files of folder x32 into newly created folder RF Scan. Double-click rtlpan.exe to start the software. Press "START" Button. The scan will start and the scan image will start building gradually. Wait for about 15 to 30 minutes for scan image to build to sufficient height. Click "STOP" button to stop the scan. In addition to scan image, a file scan.csv will be generated inside folder "RF Scan"
It will create a folder RelWithDebInfo and inside this folder another folder rtl-sdr-release which contains several files and 2 folders named x32 and x64. 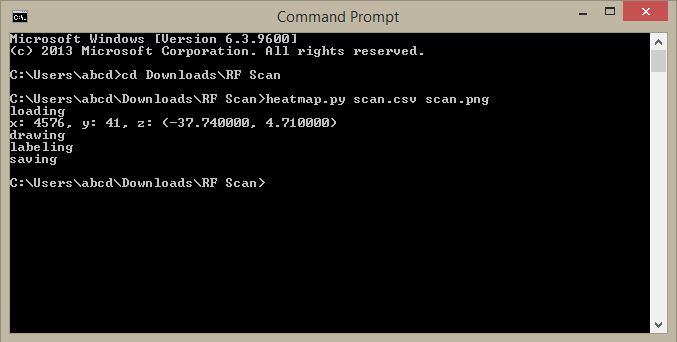 Copy following 3 files of folder x32 into newly created folder RF Scan. Download file heatmap·py by Right-Clicking on the link below, and choosing "Save Link As..."
Move the downloaded file heatmap·py into folder RF Scan. Make sure no program is using DVB-T Dongle. Stop any such program to free DVB-T. This image is very wide (4000 pixel), but displayed smaller. As a result details are not clear. Click over it to see bigger size. This is a very useful thread. Deserves to be made Sticky by the Admin. 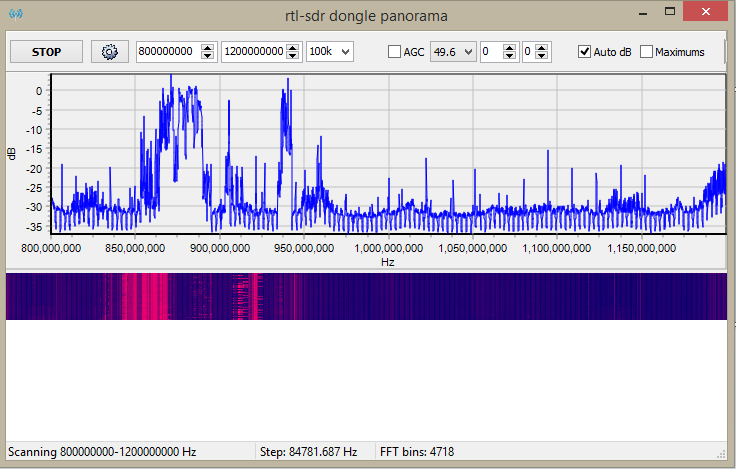 Here is RF Scan at my location showing the strong Cell / Mobile GSM signals interfering with 1090 Mhz ADS-B reception. The Downlink (signals transmitted by Cell/Mobile Towers) are very strong and cause problem to our ADS-B receivers at 1090 Mhz. The Uplinks (signals transmitted by phones) are comparatively weaker and dont cause large interference. 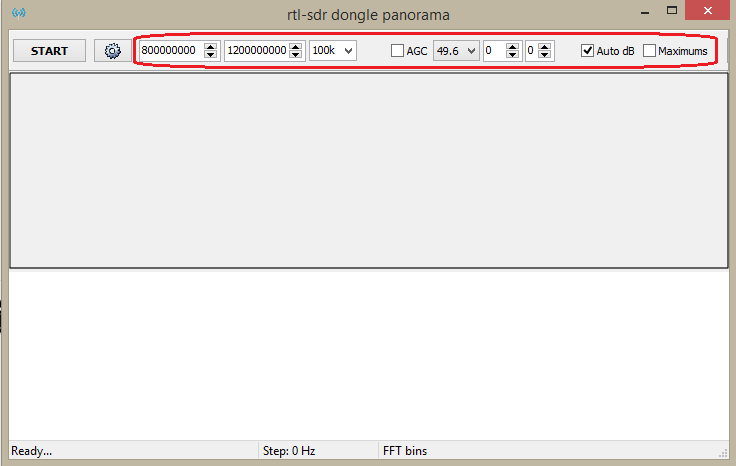 Here is my screenshot of the RF Range 800-1200MHz using the radarbox flight stick only. You still have strong GSM900 Mhz signal. Add a filter which can remove it. User @elljay has posted a scan with & without Dark Blue Filter in FlightRadar24 forum. - Top scan: Without any filter.